As I write this, the sun is coming up here in beautiful Tampa. There is something about palm trees that are in a sillhouette at this time of the morning, when everything is quiet that inspires me to blog. Or perhaps it is the strong coffee that I've been drinking for the past hour! I use this image for this blog because it is a new day in travel distribution. And while you may not have personally taken a trip by car since you were a child, you may (like I was when I started my research) to know that 73% of all trips taken in 2006 were done using a personal vehicle. And another 15% use other vehicles, such as rental cars. All told, just 12% of trips the US were by air. So if your marketing efforts are focused at the air traveler, think again. There is a BIG market out there. The drive market. How can you tell if you are air-centric? 1. If your site has a booking engine and you ask two primary questions (where are you going and when? ), then you are air-centric. 2. If you don't provide a map to your venue or driving directions, then you are air-centric. 3. If you don't acknowledge that you might not be the "destination", but might be a stop along the way, then you might be air-centric. OK, that was sounding way too much like bad redneck jokes. Nevertheless, stop, look and listen. If you aren't thinking about these things in your marketing, you may be missing a huge opportunity. My contention is that it is the drive market and the non-vacationing leisure traveler (huh? you say) that makes up this gap. Think about it. If someone is invited to a wedding or graduation, has to attend a funeral, is attending a state volleyball tournament, or a class reunion, do they come to you to plan that type of a trip? If they are driving, where are they finding their information? In the face of the economic downturn, Americans are still traveling, but not in record numbers from past years. And with less disposable income, those who are traveling are generally spending less. And this fall when the airlines "trim" their schedules to account for the increase in jet fuel prices, do you know how that 10-20% decrease in frequency and or capacity will affect you? 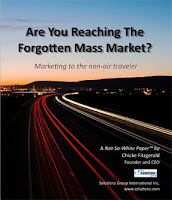 If you are interested in this subject, please check out my new "not-so-white paper" series titled "Are you Reaching the Forgotten Mass Market?". It is available for pre-order today at http://www.solutionz.com/. If you need help sorting out your strategy, let me know. I'm happy to help!